From mid-April to the end of May, Trump’s zero-tolerance policy has separated over 2,000 children from their families. The policy calls for criminally charging all adults and asylum seekers for illegally crossing the border. Adults with children have their kids taken from them because they are sent to federal jails in wait for the federal judge. In the past, they’d be held at an immigration detention center with their children for an immigration judge to see if they’d be deported. These child migrants are detained in Customs and Border Protection facilities for a maximum of three days then transferred to shelters in the custody of the Office for Refugee Resettlement. There had been about 11,000 children including the separated children and unaccompanied minors in about 100 shelters across 17 states like Texas, California, and Arizona. The younger children would be sent to shelters called “tender age” shelters in South Texas. 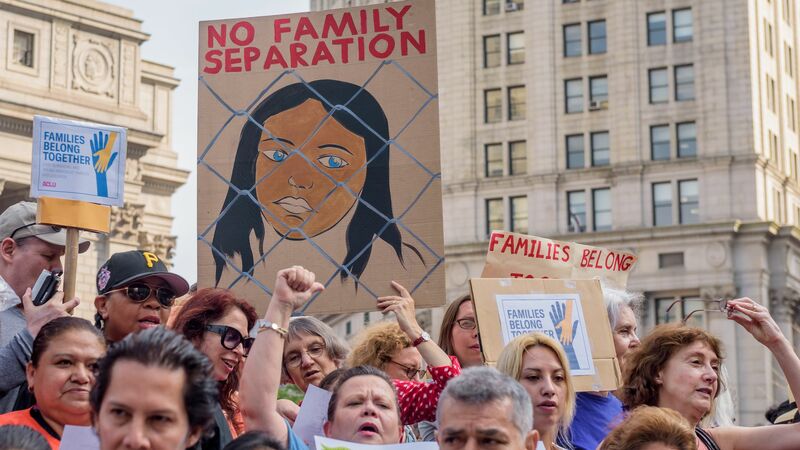 On June 20th, Trump ended the family separation policy and put in a family detention policy as replacement, but he also made it possible for authorities to detain children and unified families indefinitely. There have been at least 500 children reconnected with their families but still detained. Under the Obama administration, established family detention centers “kept families together while their cases were processed”. President Trump’s actions can only be described as immoral and inhumane. The drastic measures that he takes for the sake of the nation’s safety and security are entirely unforgivable. Even families who are fleeing from their homelands in order to seek shelter from violence or persecution, otherwise known as asylum, are being separated at the border. The children are placed in holding centers that are essentially promoting the same mentality as the modern day World War II Japanese American internment camps. Trump’s argument for keeping families separated is because he does not wish for the current refugee crisis in Europe to resemble America’s reality. Among the bold criticizers of the Trump administration’s new policy of family separation is Former First Lady, Laura Bush who vehemently claimed that the enforcement of the zero-tolerance policy has been “cruel” and “immoral”. This entry was posted in Current Events and tagged awareness, communities of color, Immigrant Rights, refugee rights. Bookmark the permalink. ← YAC PARTICIPATES IN MOBILIZING COMMUNITIES FOR HEALTHY RELATIONSHIPS CONVENING: CELEBRATING CHANGE!